Markham's mayor said flags will be lowered in her honour. 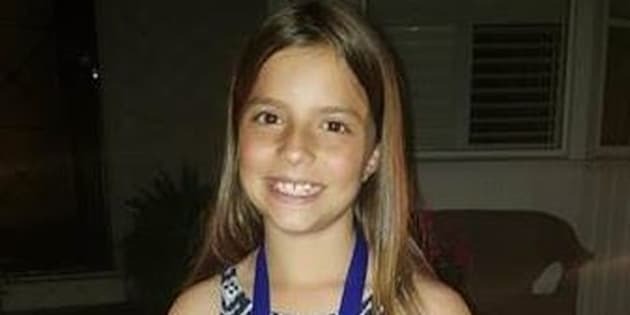 Julianna Kozis, 10, was killed in a mass shooting in Toronto's Greektown neighbourhood on July 22. The early details, as vague as they were, were painful enough. A girl. 10 years old. Caught in a hail of bullets that ripped through a busy avenue full of restaurants and shops on a pleasant summer night. And now, just days after the gun rampage that rocked Toronto's Greektown neighbourhood on Sunday, the girl has a face and a name. Late Tuesday, Toronto police identified the shooting's young victim as Julianna Kozis of Markham, Ont. She's the second confirmed fatality from the attack. Kozis' family have requested privacy as they process their grief, according to a statement from police. Toronto City Councillor Jim Karygiannis, who knows the family, told HuffPost they are "not in a good place right now." "They're trying to hold it together," he said. CTV News reports that Kozis and her family were at Demetres on Danforth Avenue getting ice cream, according to a waitress who says she served them that night. "I can't stop thinking about her," the waitress told the network's CP24. "The only thing I want to do is go to her funeral." Markham Mayor Frank Scarpitti offered his condolences to the Kozis family shortly after Julianna's name began making headlines. "This senseless act of violence has shaken us and hurt us," Scarpitti said in a statement. The city will be lowering flags at its civic centre in honour of the little girl and the other victims of the mass shooting, Scarpitti added. A book of condolences will also be available for the public to sign. Kozis was a member of the Markham Synchronized Swimming Club. The group said in a statement that it was profoundly saddened by the girl's death. "Julianna was a beautiful, aspiring athlete," the organization said. Flags at schools that are part of the York Region School District Board, which includes Markham, will also be lowered. "There are few words to adequately express the depth of sorrow that we feel. Senseless acts of violence like these leave an imprint on our communities and weigh heavy on our hearts," said the board's director of education, Louise Sirisko, in a statement Tuesday. Sunday's shooting also claimed the life of another young woman. Reese Fallon, 18, was a recent high school graduate who was planning to study nursing at McMaster University in the fall. Thirteen others were injured in the attack. A fundraiser created by one of Fallon's friends has raised more than $30,000 that will go toward a scholarship in her name. Police have named Faisal Hussain, 29, as the suspected gunman in the shooting. He was found dead at the scene of the shooting after exchanging gunfire with officers. Karygiannis said he hopes the shooting doesn't deter Torontonians from experiencing their city. "Be strong. Get out there, and don't let idiots like this influence your decision to go out and have a good time," he said.